California Consulting announces the UPCOMING Funding for Prop. 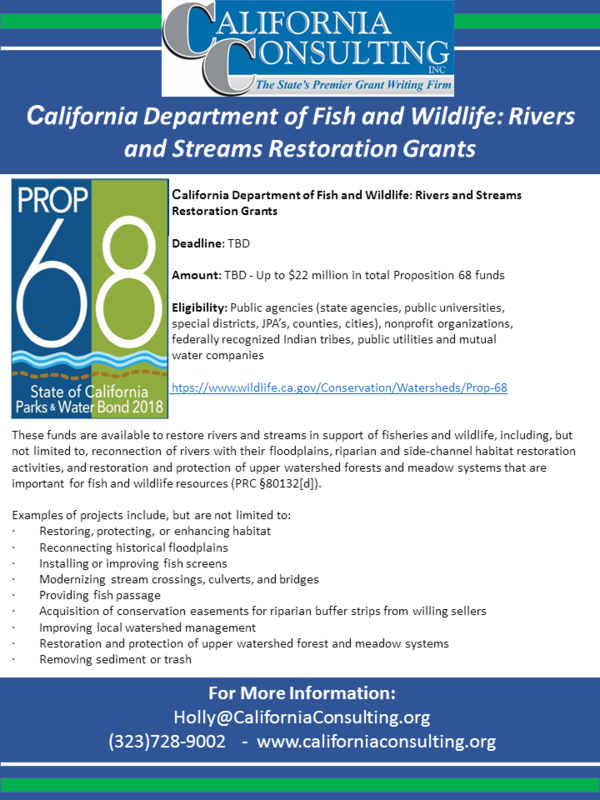 68-California Department of Fish and Wildlife: Rivers and Streams Restoration Grants Final guidelines have not been released, therefore, all details are preliminary. - California Consulting, INC. Final guidelines have not been released, therefore, all details are preliminary. California Consulting CEO Steve Samuelian attended a special roundtable discussion with Supervisor Kathryn Barger hosted by BizFed on November 8th. The meeting was located at the Kenneth Hahn Administration Building in downtown Los Angeles. Thank you BizFed for a wonderful and informative roundtable.